The September 2016 Six Grasswren tour was already the 11th year that we have done these tours. The aim was to see Striated, Short-tailed, Western, Thick-billed, Eyrean and Grey Grasswren and other wonderful outback bird species. The 6.5 day tour took us along the Strzelecki track through the outback of South Australia. It had been a wet winter and spring which means that the conditions were great for birding – probably the best I’d seen it in 5 years. There were plenty of wildflowers and birds breeding wherever we went. As a result of widespread rainfall deeper into the outback, many waterfowl had deserted their traditional wetlands to go breeding in those flooded areas, which were beyond the reach of this tour. Nevertheless, a grand total of 152 quality outback species were recorded during the tour. Read on for the daily summary and bird checklist. After a transfer from Adelaide to Berri the previous afternoon, followed by a nice meal and night in the Berri Hotel the group departed early this morning for a visit to Hattah NP (Vic) where a pair of Striated Grasswrens were located as well as Crested Bellbird, Horsfield’s Bronze-cuckoo, Regent Parrot and other goodies. Highlight of the morning were cracking views of a pair of Mallee Emu-wrens. The afternoon was spent travelling to Broken Hill but not after observing 9 Major Mitchell’s Cockatoos along the way. Good rainfall had created great conditions in the outback. Wildflowers and birds are prolific. Unfortunately some roads were under water (and hence closed) today so the Grey Grasswren site was inaccessible. We drove from Broken Hill to Tibooburra in far north-west NSW. There were plenty of good birds around including Pied Honeyeater, Cinnamon Quail-thrush, Budgerigar, Redthroat, Hobby and the highlight was no doubt an Australian Bustard showing well at close range. Was spent exploring Sturt National Park between Tibooburra and Cameron Corner. Small flocks of Budgerigars were prolific, as were Black-faced Woodswallow. Near Cameron Corner we had good views of Banded Whiteface and further Cinnamon Quail-thrushes. The incessant song of Chirruping Wedgebills and Rufous Songlarks provided a backdrop to swathes of wildflowers, the extent of which we’d not seen for 5 years. To top off day we had great views of at least 4 Eyrean Grasswrens! A full day on the Strzelecki track. Due to rain and muddy roads it was looking unlikely that we could do this most interesting part of the tour, but the all-clear was given mid-morning so off we went. We saw small groups of Crimson Chats and many Cinnamon Quail-thrushes. More small flocks of budgies, a Red-browed Pardalote and migrating White-winged Trillers. Absolute highlight of the day were 4 Letter-winged Kites on 2 nests. 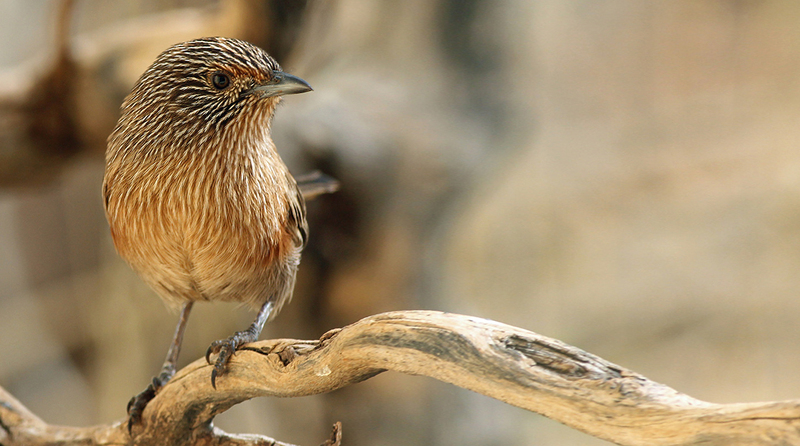 Close to the Lyndhurst end of the track, we had cracking views of a pair of Thick-billed Grasswren. An elated group of birders rolled into the Lyndhurst Pub that evening! A beautiful morning around Lyndhurst yielded Orange Chat and Rufous Fieldwren, before we entered the scenic Flinders Ranges. An adventurous trip through the Brachina Gorge with lots of water on the track but good views of Yellow-footed Rock-wallaby and Grey-fronted Honeyeater. Our lunch stop was enlivened by a Little Eagle and one of the first Rainbow Bee-eaters for the season. It didn’t take us long to track down a pair of elusive Short-tailed Grasswrens in the spinifex-covered hills while a final woodland walk yielded Red-capped Robin, Southern Scrubrobin, Crested Bellbird, Black-eared Cuckoo, Redthroat and Inland Thornbill. After an early departure from Hawker we found ourselves birding the bluebush plains near Whyalla, resulting in multiple views of at least 4 parties of Western Grasswrens. We had a sumptuous lunch at the Arid Lands botanical gardens but not after great views of a pair of Mulga Parrots and many different honeyeaters. As we commenced the final drive towards Adelaide it started raining but during a break in the weather we added Elegant Parrot, Adelaide Rosella, White-browed Scrubwren and some coastal birds before arriving back in Adelaide in the pouring rain.